Clockwise from above: a circa 1600 Nanban trade screen of ink, color, gold, and gold leaf on paper; a 16th-century Mughal-style lacquered shield with gold leaf, oil paint; and a late-16th, early-17th-century portable oratory with painting. So far as I can tell there’s been no official announcement, so it may be time for us simply to declare here: It’s “Japan Month” in New England. Even as this region sends its own treasures, both artworks and people, to Japan (masterpieces from the Museum of Fine Arts in Osaka; Caroline Kennedy preparing, according to press reports, to be the next US ambassador in Tokyo), this region is enjoying its own impressive run of Japanese exhibits. The MFA and the Currier Museum of Art in Manchester, N.H., are both hosting, or about to host, exhibitions of samurai armor. Smith College Museum of Art in Northampton has an ambitious show of Asian art, including fine examples from Japan. The MFA and the Hood Museum of Art at Dartmouth College in Hanover, N.H., both have exhibits of Japanese prints. But if you are interested in the history of interactions between Japan and the West, or in the history of globalization itself, the most compelling exhibit of all may be “Portugal, Jesuits, and Japan: Spiritual Beliefs and Earthly Goods” at Boston College’s McMullen Museum of Art. The show was organized by Victoria Weston, an associate professor of art at the University of Massachusetts Boston, and Alexandra Curvelo, curator at the Museu Nacional do Azulejo, Lisbon, in consultation with Pedro Moura Carvalho, chief curator of the Asian Civilizations Museum and the Peranakan Museum in Singapore. But one of the things globalization allows for is the possibility of things rubbing up against one another in curious, random, and often fruitful ways. A resident of Somerville, to take one example near at hand, can walk from heavily Portuguese-speaking Union Square to a little Japanese enclave at Porter Square. He can then drive 20 minutes to a museum at Boston College, an institution founded by Jesuits, where he can see a superb exhibit all about . . . guess what? Portuguese Jesuits in Japan! The thread is banal, and arbitrary in its way. But that’s globalization. You shake the kaleidoscope and who knows what pattern you’ll get. We know that the Japanese have had strongly conflicted feelings about what we now call globalization over the past 500 years. Sensing threats as often as opportunities, they have lurched back and forth from strongly isolationist policies to open-armed, avid embraces of outside influence. One crucial period of openness began in the 16th century when three Portuguese sailors were shipwrecked off the Japanese coast. They came ashore carrying muskets on an island south of Kyushu. Their curious hosts wanted to know how the guns worked. The sailors obliged. The local lord ordered his craftsmen to replicate them, and pretty soon, a warrior lord struggling for control of the country (it was a period of civil war in Japan) was waging war with his own firearms brigade and 500 matchlock guns. Within 30 years, that lord, or “daimyo,” Oda Nobunaga, had vanquished his rivals, and the reunification of Japan had begun. But Japan had not seen the last of the Portuguese. Nor were guns the only imports they brought. For they also bought Jesuits, members of a Catholic order that had only recently formed — in 1534 — and was intent on converting the people of Asia to Christianity. Their cofounder, Francis Xavier of Navarre, had arrived in Kyushu in 1549, and soon, as Portuguese ships arrived carrying Jesuit missionaries along with rare and desirable items for trade, their faith spread northward through the islands of Japan. The McMullen show hinges around four spectacular folding screens, three of them pairs. These amazing painted works — there are only about 90 in existence — depict Japanese encounters with the Portuguese trading ships that arrived in Japanese ports where Jesuit communities had already been established. They show, usually on the left, cargo being unloaded from Portuguese ships and, on the right, the Japanese ports that received the usually rare and exotic commodities they brought. The style and iconography of the screens is intriguing, and far from straightforward. They were made to divide rooms in the spacious homes of wealthy samurai. They conformed to elite tastes, including a preference for Chinese iconography. Ostensibly realistic, they hold symbols and signifiers of status that are not always easy to parse. But you don’t have to be an expert to feel the excitement they convey about these foreign arrivals and the marvelous things they brought with them, from exotic animals and ceramics to guns and religion. Some screens, for instance, show Portuguese sailors performing circus-like acrobatics in their ships’ rigging — a humorous (but quietly astounding) reminder of how strange these huge vessels were to the Japanese. Many of the objects in the show are items that match those depicted in the folding screens: a Mughal-style lacquered shield, for instance, picked up en route, chairs, standing screens, a Chinese picnic box, and of course beautiful textiles (these have been borrowed from the Museum of Fine Arts). Others are items made by Japanese artisans. Some, such as a writing-utensil box adorned with caricatures of the Europeans, reflect their curiosity — and anxiety — about the people they called “nanban-jin,” or “southern barbarians” (because they arrived from the south). Others were made specifically for trade with Europe, or for religious purposes. 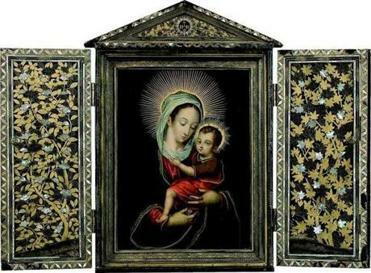 There are oratories holding portraits of the Virgin and Child with folding doors elaborately decorated with Japanese lacquer, gold powder, and mother-of-pearl. A tabernacle and a pyx for holding Eucharistic wafers are similarly decorated. All of these objects are fascinating, at times almost charismatic evidence from this early chapter in the history of globalization. By the mid-1570s, the Jesuits had become well organized in Japan. They made a point of learning Japanese (a monitor in the exhibition shows pages of an early Japanese-Portuguese dictionary compiled by Jesuits), and they eagerly shared valuable knowledge, including newfound discoveries about the shape of the world. Bear in mind, the voyage from Portugal, which rounded the Cape of Good Hope, usually stopping in Mozambique, Goa, Malacca, and Macao, before arriving at ports in Japan, typically took four years. A fascinating section of the show, displaying maps made by both Europeans and Japanese, conveys the thrill of worlds expanding — and identities subtly shifting — as cartographic knowledge was shared between the two cultures. Nobunaga was assassinated in 1582. At first, his successor, Toyotomi Hideyoshi, was as friendly as his mentor had been to the Christians from Europe. But as Weston writes in the catalog, this changed when he began to perceive Christianity as a threat. He issued an edict forbidding the Japanese elite from converting to Christianity. Hideyoshi soon became preoccupied with an invasion of Korea and then China, so enforcement of the edict was lax. By 1593, when the Chinese pushed back Hideyoshi’s forces, he actually welcomed other Catholic religious orders into Japan, including Franciscans, Dominicans, and Augustinians (this, as Weston points out, may have been a canny attempt to counteract or diffuse the Jesuits’ influence). Three years later, however, Hideyoshi had a band of 26 Franciscans executed in Nagasaki. It was an ominous sign. Hideyoshi died himself the following year. In 1600, after two years of strife, a new strongman, Tokugawa Ieyasu, emerged, receiving the title of “shogun,” and inaugurating 268 years of Tokugawa rule. Ieyasu was at first happy to coexist with the Catholics, so long as they did not convert any more members of the elite. But by now, more than 300,000 Japanese had converted to Catholicism. Anxious to consolidate his power, and nervous, too, about Spanish maritime might, Ieyasu eventually decided that he could no longer tolerate the spread of Christianity. He issued a new, stricter edict. Seeing the writing on the wall, the Portuguese departed for Macao en masse in 1614. Within a few years, the possibility of European contact with Japan had been effectively strangled, with only a few tightly controlled trading posts allowing for trade — not with Iberian Catholics but with the less religiously zealous Protestant Dutch. What might have happened if the Jesuits had been allowed to continue their incursion into Japan? How would Japanese culture have changed, and would Japan have exerted anything like the pull on the Western imagination that it later did, particularly in the 19th century? Impossible questions. When, in 1622, two Catholic missionaries were caught trying to sneak back into Japan, the new shogun, Ieyasu’s successor, was so livid that he ordered the execution of all Christians then held in Japanese jails. Fifty-two priests and lay brothers were burned at the stake or beheaded. The “Great Martyrdom of Nagasaki,” as it became known, is depicted in a painting now in Rome. It is presented in large-scale reproduction here, as a grisly bookend to this show and its fascinating story of a suddenly curtailed interaction between two cultures from opposite ends of the earth.